_ Digital therapeutics deliver evidence-based therapeutic interventions to patients that are driven by high quality software programs to prevent, manage, or treat a medical disorder or disease. They are used independently or in concert with medications, devices, or other therapies to optimize patient care and health outcomes. Medical condition: Targets type 2 diabetes that is treated with long-acting insulin analogs. Target patient population: Adult patients with type 2 diabetes being treated with long-acting insulin analogs to manage their diabetes. What to expect: Recommends personalized insulin doses and coaches patients to better manage their diabetes. Indications for use: Insulia® is a prescription-only software medical device intended for use by healthcare professionals and their type 2 adult diabetes patients treated with long-acting insulin analogs as an aid in the management of diabetes. Outcomes: In the Telediab 2 randomized trial in France using a predecessor device to Insulia called “Diabeo-Basal” with patients naïve to basal insulin (baseline A1C 8.9±1.1% ) there was a statistically significant difference in A1C between the control group and Diabeo-Basal groups at 4 months (7.96±0.88% and 7.47±0.9% respectively, p=0.0017). Twice as many patients in the Diabeo-Basal group achieved A1C <7% vs. control (Diabeo-Basal 29.8% vs 12.5%). This study showed that interventions using automated insulin titration software improved glucose control as compared with standard care. Diabeo-Basal is not approved nor cleared for use in the US. Directions: Healthcare practitioners prescribe the app by creating a treatment plan tailored to the person’s needs, which generates an activation code. When the person downloads the app and enters their code, Insulia is already set up to follow their personalized dosing plan. They just add their fasting blood glucose values and Insulia will recommend basal insulin doses every day. 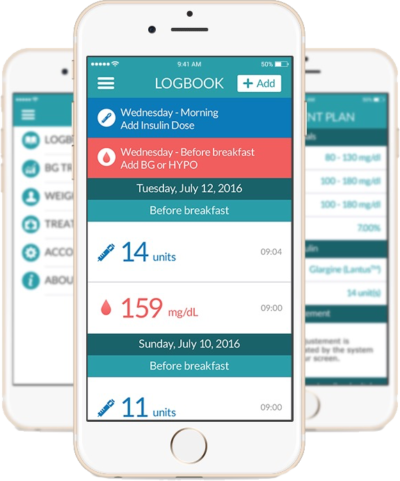 Whether people take their insulin in the morning or evening, experience hypo symptoms, or switch insulins, Insulia adapts to its users so that they have accurate and reliable dose recommendations at their fingertips. Since Insulia connects to a corresponding web portal, healthcare practitioners are able to follow their patients’ progress in real-time and help them when needed. Coaching messages and support ensure that people are never alone as they work to get to the right dose. Risks & warnings: Insulia® should not be used for basal dose recommendations with intermediate-acting insulin (NPH – Neutral Protamine Hagedorn) nor with premixed insulin. Insulia® is not intended for use by pregnant women, non-adult patients, or patients that are treated with a basal-plus or a basal-bolus regimen (i.e. including multiple mealtime insulin injections per day or insulin pump therapy). Place in therapy: Complementary to basal insulin therapy. Product description: Insulia is a software medical device that supports insulin titration for people using any brand of basal insulin including Lantus®, Levemir®, Toujeo®, Tresiba® (U-100), and Basaglar®. It may be used on a compatible smartphone or computer. Prescription status: A prescription is required from a qualified healthcare provider. Patient access: Patients download Insulia through their smartphone on the Apple or Google App Store. They can also access a web portal if they do not have a smartphone. An enrollment code is generated for patients after their healthcare provider completes a prescription. Provider access: Healthcare providers may access the Insulia dashboard to prescribe Insulia to their patients, as well as monitor for real-time health trends, potential issues, and view patient-generated health data. Patients are automatically triaged so that those who need attention are seen first. These dashboards are accessible through the Insulia clinician web portal and through tailored notifications. Coverage options: Insulia is typically paid for by insurance plans. A Savings Program may be available. Insulia was the first prescription-only digital therapeutic to receive FDA clearance for basal insulin titration.